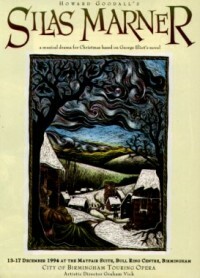 Silas Marner was commissioned for the Salisbury Festival in 1993. It was premièred in Wilton Parish Church, and then given as a full-scale production by the City of Birmingham Touring Opera – directed by Graham Vick and conducted by Simon Halsey – in December 1994. Housed in a huge space under the Bull Ring Centre in Birmingham, this was community opera at its most vivid; a cast of hundreds of local amateurs played alongside professionals to provide an immediate and real sense of a tight-knit community. Howard wrote the libretto as well as the score, and was pleased not to have to abridge the novel too drastically: “The great thing about Silas Marner compared to other 19th century classics such as Oliver Twist or Les Miserables is that it is comparatively short! You can use the whole story and do it justice in just an hour and a half”.